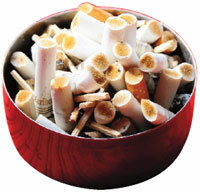 IT IS well known that smoking causes premature death and disability. Little data is, however, available on the number of such deaths in India. Researchers from the International Union Against Tuberculosis and Lung Disease in Delhi and the Healis Sekhsaria Institute for Public Health in Mumbai have drawn up estimates for the number of deaths due to smoking between 1910 and 2010. Data from industry reports, trade journals and the Union agriculture ministry showed 4.52 trillion cigarettes and 40.3 trillion bidis were produced in the country during the last century. The researchers linked these estimates to findings from the Mumbai Cohort Study done in the late 1990s to calculate the number of lifetime smokers of these cigarettes and bidis and then the premature deaths resulting from smoking them. The results show that smoking of bidis and cigarettes manufactured between 1910 and 2010 could be responsible for the premature and early deaths of at least 100 million men aged 35 and above. Bidis accounted for 77 per cent of these deaths. “Our study estimates another 100 million smokers will die prematurely in the first half of the current century,” says lead researcher Pranay G Lal of the International Union Against Tuberculosis and Lung Disease. The study was published on November 10, 2012 in Current Science. Lal says that instead of promoting the tobacco industry, the government should urgently prioritise evidence based tobacco control methods such as high specific taxes and strong and graphic health warnings on all tobacco products.